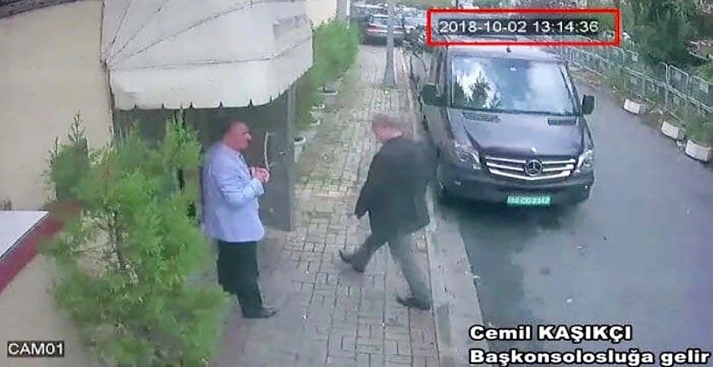 A still image made available to the Associated Press on Tuesday Oct. 9, 2018 taken from CCTV video obtained by the Turkish newspaper Hurriyet claiming to show Saudi journalist Jamal Khashoggi entering the Saudi consulate in Istanbul, Turkey on Oct. 2, 2018. Turkey said Tuesday it will search the Saudi Consulate in Istanbul as part of an investigation into the disappearance of a missing Saudi contributor to The Washington Post, a week after he vanished during a visit there. Two Gulfstream jets carrying 15 Saudis landed at Istanbul's Ataturk Airport before dawn on the day last week that journalist Jamal Khashoggi entered the Saudi Consulate and vanished. The men checked into hotels and left Turkey later that night. Turkish media, which released surveillance camera video of the men on Wednesday, said they were members of an elite Saudi "assassination squad," sent to kill Khashoggi, a Saudi critic. Adding to the macabre mystery, a Turkish official told The Associated Press that one member of the team was an "autopsy expert." Saudi Arabia has dismissed allegations it played a role in Khashoggi's disappearance as "baseless," but it has offered no evidence to support its contention he left the consulate unharmed last week and vanished into Istanbul while his fiancée waited outside. The video, shown on the state-run broadcaster TRT and others, did not offer definitive proof about Khashoggi's fate. Turkish officials have said that they fear the team killed Khashoggi. President Donald Trump said the U.S. is "demanding" answers from Saudi Arabia about Khashoggi and wants to bring his fiancée, Hatice Cengiz, to the White House. He added that he spoke with the Saudis about what he called a "bad situation," but he did not disclose details. Earlier, U.S. officials warned that any harm done to the 59-year-old Washington Post contributor will jeopardize its relations with the kingdom, its close ally and the world's largest oil exporter. Angry U.S. lawmakers likely won't cause the administration to turn away from Prince Mohammed. But they could throw a wrench into arms sales requiring their approval and demand the U.S. scale back support for the Saudi military campaign against Iran-backed rebels in Yemen. The Turkish security camera video was reminiscent of the surveillance video sleuthing done by officials investigating the assassination of a Hamas operative in Dubai in 2010 or the slaying of North Korean leader Kim Jong Un's half brother in Malaysia in 2017. The Sabah newspaper, which is close to Turkish President Recep Tayyip Erdogan, published images of what it referred to as the "assassination squad," apparently taken at passport control at the airport. The state-run Anadola news agency published the names and birth dates of all 15 Saudis. The footage shows some of the Saudis leaving a hotel and Khashoggi entering the consulate, walking past a black Mercedes van with diplomatic plates parked adjacent to the entrance. An hour and 54 minutes later, according to the time stamp, a black Mercedes van drives about 2 kilometers (1.2 miles) to the consul's home, where it was parked in a garage. Two Turkish officials, speaking on condition of anonymity to the AP because the investigation into Khashoggi's disappearance was still ongoing, confirmed the authenticity of the images in the Turkish media. One of the officials describes a member of the Saudi team as an "autopsy expert" amid earlier allegations that Khashoggi had been killed and dismembered. The Hurriyet newspaper and other media alleged that the Saudi Consulate's 28 local staff were given the day off Oct. 2 because a "diplomats' meeting" would be held there on that day. The reports did not cite a source and there was no official confirmation. Turkey's private NTV news channel identified one of the 15 Saudis who arrived as the head of a Saudi forensic science agency. It alleged that he may have been responsible for cleaning up any incriminating evidence. The station did not cite a source for its report. Khashoggi had written a series of columns for the Post that were critical of Saudi Arabia's assertive Prince Mohammed, who has led a widely publicized drive to reform the conservative Sunni monarchy but has also presided over the arrests of activists and businessmen. Erdogan has not accused Saudi Arabia of being responsible for Khashoggi's disappearance but has said that if the Saudis have video footage of him leaving the consulate, they should release it. Saudi Arabia is a major investor in Turkey, despite Ankara's support for the Gulf nation of Qatar, which is under a blockade led by Saudi Arabia and three other Arab nations. On Wednesday, the Post published a column by Cengiz, who said her fiance first visited the consulate on Sept. 28 "despite being somewhat concerned that he could be in danger." He returned there Oct. 2 after being promised the necessary paperwork so the two could be married. Trump, whose first overseas trip as U.S. president was to the kingdom and whose son-in-law Jared Kushner has close ties to Prince Mohammed, said Tuesday he had not yet talked to the Saudis about Khashoggi, "but I will be at some point." Associated Press writer Sarah El Deeb contributed.